Step up the difficulty level of your socks a few notches by using a non-rectangular 12 stitch x 22 row repeat pattern that combines yarn overs and texture on every row. The yarn overs are fairly subtle, leaving the sock a little airy but not too lacy. The curved twisted stitch ribbing adds asymmetry and depth. 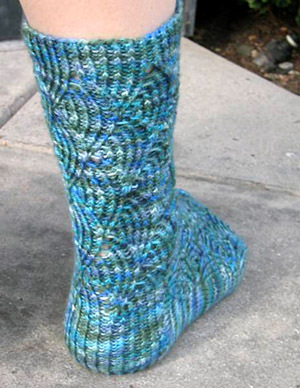 The finished socks are reminiscent of blue-green fish scales hence the name Pomatomus, the genus of the blue fish. If you are up for a challenge, then the Pomatomus is for you. Blue fish are somewhat vicious with sharp teeth, powerful jaws, and a cannibalistic tendency. Stay alert, and you should wade through these socks just fine. Though 5 needles are required, only 4 of them will be used for most of the sock. (Dividing the sts over 3 needles, instead of 4, will help you keep track of the stitch pattern.) Only the gusset is worked with all 5 needles. If you are unfamiliar with grafting, instructions can be found here. Pomatomus is knit using a top-down construction. The cuff and heel flap are knit in 1x1 twisted rib. The gusset, bottom of the foot, and toe are worked in stockinette stitch. Chart A gives the stitch pattern for the leg. Chart B is a modified form of Chart A, used for the top of the foot. While Chart B may seem confusing and unnecessarily complex, the modifications are necessary to make the top of the foot rectangular as Chart A does not create a rectangular pattern (despite what the chart may lead you to believe). Due to the circular construction of a sock, the only parts that are knit back and forth are the heel flap and turning. The patterned parts are knit in the round where every row is a right side row. Therefore, the charts are read from right to left (the same direction as you knit) on every row. The following is a key to the chart. Note that these symbols may not mean what you are used to! CO 72 sts. Divide sts evenly between 3 needles (24 sts on each needle), place marker and join to begin working in the round, being careful not to twist. Round 1: [P1, k1 tbl] to end. Repeat this round 9 times more. Work Rounds 2-22 of Chart A. Move first stitch from Needle 1 to Needle 3 by knitting the first stitch on Needle 1 through the back loop onto Needle 3. Move first stitch from Needle 2 to end of Needle 1. Move first stitch from Needle 3 to end of Needle 2. Work Rounds 1-22 of Chart A.
Repeat from * once more. Move first stitch from Needle 1 to Needle 3 by knitting first stitch on Needle 1 through the back loop and transferring that stitch onto Needle 3. Transfer first 13 stitches from Needle 2 to Needle 1. Transfer remaining stitches from Needle 2 to Needle 3. You will have two needles with 36 stitches each. The heel flap is knit back and forth over the sts on Needle 1 only. Turn your work after each row of the heel flap. Row 1 [RS]: K2tog, [p1, k1 tbl] to end. Row 2 [WS]: Sl 1, [k1, p1 tbl] to end. Row 3 [RS]: Sl 1, [p1, k1 tbl] to end. Row 4 [WS]: Sl 1, [k1, p1 tbl] to end. Repeat Rows 3 and 4, 12 times more. Row 1 [RS]: Sl1, k19, ssk, k1, turn work. Row 2 [WS]: Sl 1, p6, p2tog, p1, turn work. Row 3 [RS]: Sl1, k7, ssk, k1, turn work. Row 4 [WS]: Sl 1, p8, p2tog, p1, turn work. Row 5 [RS]: Sl1, k9, ssk, k1, turn work. Row 6 [WS]: Sl 1, p10, p2tog, p1, turn work. Row 7 [RS]: Sl1, k11, ssk, k1, turn work. Row 8 [WS]: Sl 1, p12, p2tog, p1, turn work. Row 9 [RS]: Sl1, k13, ssk, k1, turn work. Row 10 [WS]: Sl 1, p14, p2tog, p1, turn work. Row 11 [RS]: Sl1, k15, ssk, k1, turn work. Row 12 [WS]: Sl 1, p16, p2tog, p1, turn work. Row 13 [RS]: Sl1, k17, ssk, k1. Row 14 [WS]: Sl 1, p18, p2tog, p1. 21 sts rem. The gusset is knit with 5 needles. K 21 heel sts; this needle will be designated Needle 1. Using a second needle, pick up and k 15 sts along side of heel flap, and 1 st between top of heel flap and held sts; this needle will be designated Needle 2. Using a third needle, work across held sts as follows: [Yo, k2tog, (p1, k1 tbl) five times] three times; this needle will be designated Needle 3. Using a fourth needle, pick up and k 1 st between last st worked and top of heel flap, then pick up and k 15 sts along edge of heel flap; this needle will be designated Needle 4. Next Round: K all sts on Needle 1; k tbl all sts on Needle 2; work Row 2 of Chart B over all sts on Needle 3; k tbl all sts on Needle 4. Next Round: K all sts on Needle 1; k to last 2 sts on Needle 2, k2tog; work Row 3 of Chart B over all sts on Needle 3; ssk, k to end of Needle 4. 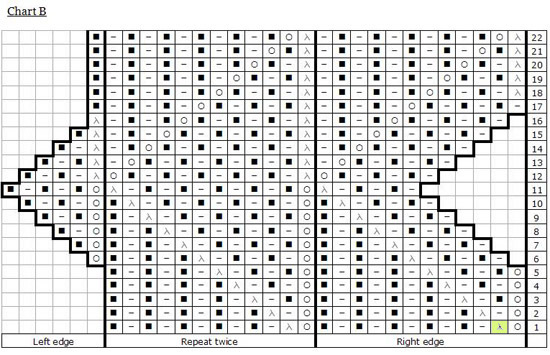 Next Round: K all sts on Needle 1; k to last 2 sts on Needle 2, k2tog; work next row of Chart B over all sts on Needle 3; ssk, k to end of Needle 4. Next Round: K all sts on Needle 1 and Needle 2; work next row of Chart B over all sts on Needle 3; k all sts on Needle 4. Repeat these 2 rounds 8 times more. 6 sts rem on Needle 2 and Needle 4 each. Note: On Rows 17-22 of Chart B, there will be 1 extra st on Needle 3 (37 sts). Next Round: K all sts on Needle 1; k to last 2 sts of Needle 2, k2tog; work next row of Chart B over all sts on Needle 3; k all sts of Needle 4, then k first 10 sts from Needle 1 onto this needle. K 11 rem sts from Needle 1 and all 5 sts from Needle 2 onto one needle; this will now be designated Needle 3. Work all sts from next needle in patt; this will now be designated Needle 1. K rem sts from rem needle; this will now be designated Needle 2. K all sts of (new) Needle 3; you are now at the newly designated beginning of the round. Work in patt as set, working through Rows 1-22 of Chart B on Needle 1 and working sts on Needles 2 and 3 in stockinette st, until foot measures 2 inches less than desired length. Next Round: Work all sts in patt as set, EXCEPT: omit all yarnovers (YOs) in Chart B. 3 sts decreased. 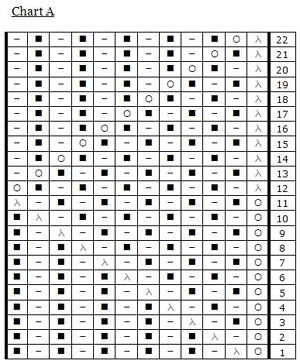 You will have 33 or 34 sts, depending on which row of Chart B you last worked. Next Round: Work all sts in patt as set, EXCEPT: if you have 33 sts remaining on Needle 1, omit the first yarnover in Chart B; if you have 34 sts remaining on Needle 1, omit the first 2 yarnovers in Chart B. In both cases, omit the sts that would have been formed by the yarnovers in the previous row. You will now have 32 sts on Needle 1; 64 sts in total. Next Round: K1, ssk, k to last 3 sts on Needle 1, k2tog, k1; k1, ssk, k to end of Needle 2; k to last 3 sts of Needle 3, k2tog, k1. 4 sts decreased. Repeat these 2 rounds 12 times more. 12 sts rem. Slip sts from Needle 2 onto Needle 3. Break yarn, leaving a 12 inch tail. Graft sts on Needle 1 to sts on Needle 3. 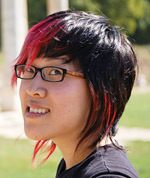 Cookie is an obsessed knitter living in California. In her spare time, she co-authors a blog (along with Kristi, the flesh-and-blood sock model) and maintains a website for the Lacy Knitter's Guild.